It is a little hobby of mine to turn delicious savory flavor combinations into sandwiches (and sweet combos into candies & cupcakes). This recipe is my latest creation. The original dish, or course, was sweet and sour pork, usually cooked with bell peppers and green onions and sometimes pineapple, and served with rice. 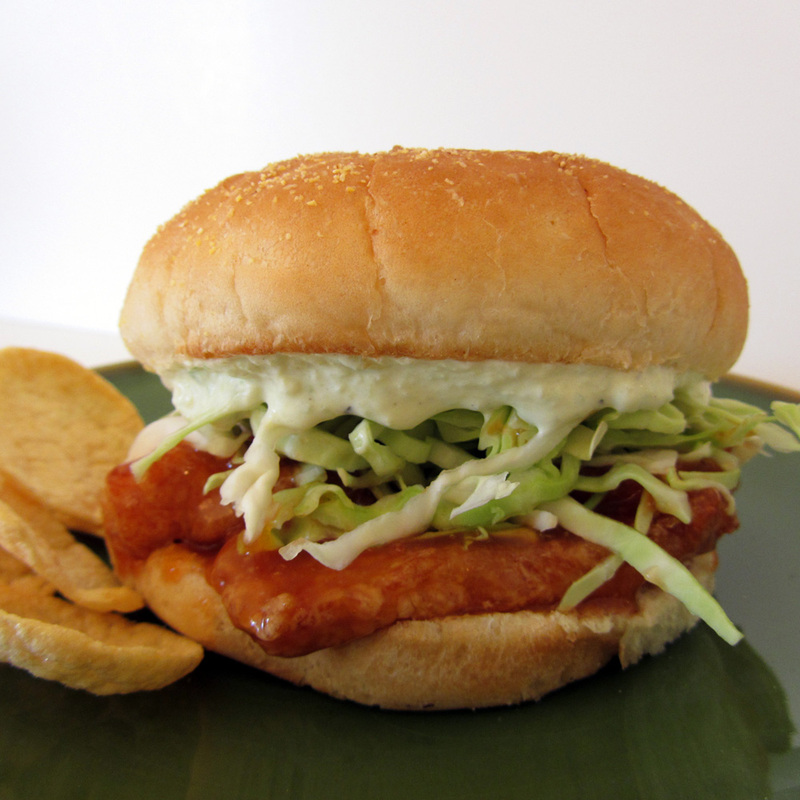 The sandwich is made with sweet and sour pork cutlets, pepper sauce, and cabbage. My family agrees on very few dinner-type foods. They all liked this one! The first challenge in this recipe was to decide on a sweet and sour sauce. There are so very many variations out there. In the end, I made my own. It is simple, which I like, because authentic sweet & sour is uncomplicated, without a lot of the additional ingredients you sometimes find. The next challenge was how to incorporate the bell pepper and green onion. Also, whether or not to use cheese. After a lot of digging, I found a very interesting recipe for a bell pepper cream cheese spread on Food.com. I must say, I was skeptical. Very skeptical. The ingredients do not sound like a sure thing. But they actually work very well together. And, they're absolutely perfect for this sandwich. I did make some changes to the recipe so that it would work a little better for my purposes here. So, with the sweet & sour and the pepper sauce squared away, I only needed to add some green cabbage for freshness and crunch, and pop it all onto a delicious roll (I used Orowheat Crustini). Voila! A sandwich was born! 1. For the pepper sauce: combine all of the ingredients in the small bowl of a food processor. Process until smooth, stopping to scrape the bowl as needed. Transfer the mixture to a bowl, cover, and chill for at least an hour. 2. For the sweet and sour sauce: in a small saucepan, whisk together the brown sugar and cornstarch (to avoid clumping). Whisk in the ketchup and water until smooth. Whisk in the vinegar. 3. Bring the sauce to a boil, whisking constantly. Reduce the heat and simmer for 1-2 minutes or until thickened. Remove from the heat. Cover and set aside. 4. Slice the pork tenderloin into thin discs, about ¼” thick. If the meat is not all the same thickness: Lay the slices in a single layer. Place plastic wrap over the slices. Pound to an even thickness with a meat pounder. 5. Place the meat into a large Ziplock bag along with the 1/3 cup of cornstarch. Seal and shake vigorously until each of the discs is coated evenly. Set aside until ready to use. 6. Heat about an inch of oil in a large skillet or pot. Bring the oil to 350° (and maintain this temperature throughout the cooking). 7. Working with only a few of the pork discs at a time, shake off any excess cornstarch and place into the oil, being careful not to crowd the pan (meat should not be touching). Fry until very light golden, flipping once (about 1-2 minutes total). Transfer the cutlets to a paper towel-lined baking sheet. Repeat with the remaining pork discs. 8. Pour the sweet and sour sauce into a clean 12” pan (or discard the oil and wipe the frying pan clean). Heat just until hot. Quickly toss the cutlets in the sauce (no need to cook them further). 9. Open 4-6 buns. Distribute the pork evenly onto the bottom buns. Spread about 2 tbsp of the green pepper sauce on each bun top (you may have extra sauce, which is great to use as a veggie or cracker spread, or to toss with any leftover shredded cabbage). Stack some cabbage onto each bun bottom and assemble. Serve!